Half and Half Pipe Tobacco has proven to be a favorite with pipe smoking enthusiasts since 1909. Each pouch or tin can of Half and Half Pipe Tobacco is packed full of high quality loose cut Burley and Virginia tobaccos with flavorful notes of Cardamom, Coriander and Maze. Nicknamed "Burley and Bright" this mild-medium bodied aromatic blend of exceptional tobacco continues to deliver smooth and easy flavorful smokes over and over. Half and Half is the perfect ideal pipe tobacco brand for smokers everywhere as it is now sold in 15 countries and cherished by customers from around the world. 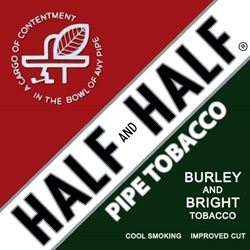 Half and Half Pipe Tobacco is distributed nationwide by Scandinavian Tobacco Group in Tucker, Georgia. Available at our online tobacco store Half and Half Pipe Tobacco is offered in unique styles to choose from. Currently available Aromatic 14 oz. Tin Can. Here at Smokers Discounts we offer you a great way to relax and enjoy a great quality smoke at an inexpensive price. Carter Half and Half Pipe Tobacco is an excellent choice for your pipe smoking needs. Our online tobacco store was created to make it easy and affordable to buy pipe tobacco online. Call us for more details!